"Same Day Service Available if in by 9am"
Dry cleaning (or dry-cleaning) is any cleaning process for clothing and textiles using an organic solvent rather than water. The solvent used is typically tetrachloroethylene (perchloroethylene), abbreviated "perc" in the industry and "dry-cleaning fluid" by the public. 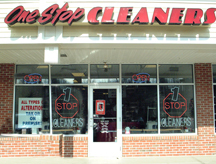 Dry cleaning is necessary for cleaning items that would otherwise be damaged by water and soap or detergent. It is often used instead of hand washing delicate fabrics, which can be excessively laborious.